Podio is an award-winning online platform with a new take on work and how it gets done. For the first time ever you can create your own work tools and shape the way you work. No technical skills required. No dependency on IT. Get Podio, and start working the way you always wanted. ★Workspaces: Create as many as you wish to collaborate, share files with unlimited storage, and get work done together with anybody you invite. A project to manage, your CRM to build, a recruiting process without email or an entire social intranet - you decide. ★Apps: Anyone can build an app on Podio, without technical skills. 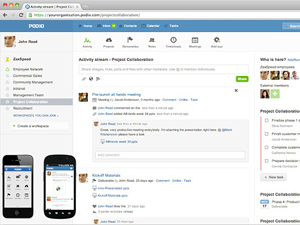 More than 500,000 social workflow apps have been built or modified by Podio users for about anything you can imagine!